Citizens have been disappearing late at night and it turns out they were being kidnapped by Troggies – the descendants of citizens that chose to live underground to escape the furious pace of modern life. Judge Dredd went down on a one man rescue mission and found they were planting bombs to bring down the Mega City from below. The subterranean dwellers and their leader Slick Willy were rounded up by the Justice Department. Interesting antagonists, imaginative language and characterisation. The timeline means that the New York Subway was closed in 1999 though. Dredd’s Dead Baby – Dredd’s Dead! Or so we thought. The Justice Department spent a fortune in tax money on a fake funeral in order to trap corrupt Judge Gibson. Gibson who was from the same graduating class as Dredd committed robbery and murder disguised as Mutie the Pig. Dredd apprehended him and in a duel of honour at the Academy of Law killed him, sparing him the mandatory 20 year sentence in the Penal Colony on Titan. Dredd was heard to say “It was a bitter victory. Judge Gibson was my friend” That’s right folks Dredd once had a friend. You heard it here first. A dramatic opening to a double issue story that has drama and emotion. 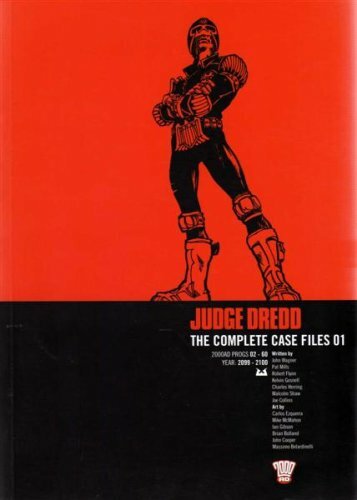 A good use of characters and locations introduced previously and other chance to see more of Dredd as a person not a machine. Dredd takes down gang of four with stun shots in late night confrontation. We are seeing the start of an over-reliance on using Walter as the kidnapped girlfriend plot device. But not a bad story. Shortly after opening, Komputel, Mega City’s first fully automated hotel, began killing its guests. Luckily Mega City’s top lawman Judge Dredd, who was on crowd control nearby, stepped in to save the day. Interesting sci-fi theme and comment on the automation of society. Dredd’s attitude to machines is still as black and white as ever.